Jump in the wayback machine to 2012. That’s when James Clear launched his blog to write about habits and human potential. And it was the start of something amazing. He committed to publishing twice a week, adopted a series of success habits to improve, and stayed the course. In just a few short years, he garnered a massive following of readers and earned a spot on the New York Times best-seller list for his book Atomic Habits. We talked with James on a recent podcast for the Freelance Writers Den. Q: What did your process look like when you got started? A: Each part of the process I tried to do the best I could with that chunk of work. Then leverage that chunk into the next step. You can’t just jump from your first couple blog posts to a book deal. Instead, I had to do a couple good blog posts, try to get one of those featured on Lifehacker, or Business Insider, or something. I knew that would be a good strategy to get subscribers and build up an email list. Q: How do you know if you’re making progress? Sometimes it’s hard to tell from day to day. But if you’re consistently showing up, you’ll turn around one day and be kind of surprised by how much progress you’ve made. If you just sit there and think about where you want to be and how far that is away, then it can feel overwhelming and intimidating. So, it’s really that commitment to continuous improvement that allows you to go from one to the other. Q: What’s the 1% approach to success? A: It’s this idea that self-improvement habits have compound interest in self-improvement. If you can just manage to get 1% better each day, you end up in a pretty remarkable place in a year or two. The challenge is remembering that on any given day a choice that’s 1% better or 1% worse is fairly easy to dismiss. It doesn’t really feel like a whole lot. It’s the difference between eating a burger and fries for lunch today or eating a salad. Not a whole lot on any given day. Your body looks the same in the mirror at the end of the night. The scale doesn’t really change that much. It’s easy to feel like, “Oh, just this time. It’s not that big of a deal.” But it’s only when you turn around two, or five, or ten years later, that you realize your daily choices really do add up. Q: What’s the two-minute rule you follow for writing? A: I wake up. I grab a glass of water. I sit down in my chair at the desk, and I open up Evernote. That sequence, that can be pretty much an automatic habit. As long as I do that, then I’m in the space where I can actually type the first sentence. Q: Why do people overlook baby steps like the two-minute rule? A: It sounds kind of silly to people at first. It’s easy to think getting ready to write isn’t really a useful habit. But what you have to realize is that a habit must be established before it can be improved. Right? You have to make it a standard in your life before you can optimize it. Q: What’s your morning routine look like? A: It’s not perfect. Every morning around 9 a.m., I sit down and either I open up Evernote and start working on the next article, or I go to ESPN and I check the latest sports news. Really what happens in the next 45 minutes is heavily determined by what happens in the first 45 seconds. Q: What’s one productivity habit you’ve developed to be a better writer? A: Here’s one example. I refined my Twitter following so it’s this curated source of information. I’ve turned it into a place where I can come across ideas and find people who are sharing interesting things that can spark a thought for something I could write about. Q: What habits would you recommend to learn how to write effective headlines? A: Want to write better headlines? That’s a huge, huge piece of any article, or book, or chapter title. Try this. Spend an afternoon trying to get 1% better at it. What templates and formats do they use? Can I adapt that a little bit to whatever piece that I’m working on? You could do the same kind of thing to learn how to write better opening lines or better transitions from one idea to the next. Q: How do you overcome perfectionism and procrastination? A: Establish a scope or schedule. And set a time limit for writing. This can be really important if you find yourself getting into research spirals or whatever. I helps you think like: “Okay. I have two hours to research great opening lines.” You give yourself that, and then you can move on. Q: What’s the one success habit that’s helped you the most? A: I just keep asking: What is the next step? What is just one little level above? Can I reach up to that this time? It’s like climbing a ladder. It’s very methodical and slow, and there are some times you go down a rung, and sometimes you go up two, but you need to stay committed to the idea: How can I just move the needle a little bit today? 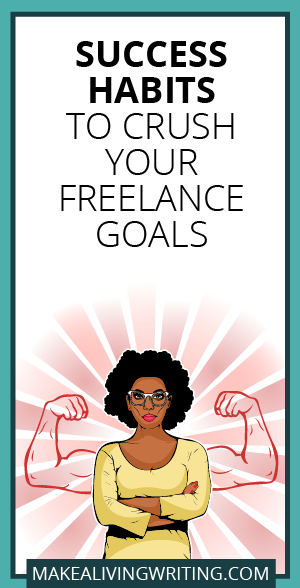 How do you go from just getting by as a freelance writer to making a great living? Consistent marketing. Looking for ways to improve by just 1% at a time. Taking action. And creating habits, no matter how small, to help you move up and earn more. What habits do you recommend for freelance success? Lets discuss in the comments below. Congratulations James. It’s quite interesting how life works. I learnt about Atomic Habits just a week ago and two days ago a read a few free pages on Amazon. Meeting you and Carol here is a clear case of the saying, when the student is ready, a teacher will appear. You have written a great book and I’m ordering a copy from Amazon. Initially I was a little bit skeptical because of the title but when I opened it I got convinced. It’s well researched and well written. As we say in my part of the world, when I grow up I want to be like you. Congrats and thanks for the profound ideas you have shared here. Looking forward to meeting you some day. Spend some time with mechanics. I see all sorts of helpful, conceptual advice in writing blogs. What I don’t see much about is the “plumbing” needed to turn writing into a production line. The Amazon self publishing process is more effort than most suppose – everything from getting “bleeds” right on a cover to making sure chapters start on the right hand page. The humble MS Word package has a wealth of features which, if used, can speed any writer to the real end point — their book on the shelf, available for sale. Writers need to spend some upfront time with (boring) mechanics so that develop a reliable system of delivery. After that all the fun stuff of writing begins. Ignore the romantic picture of the writer in a cabin in the great smoky mountains, thoughfully pounding away … the front end is a lot uglier and messier than that. Hold your nose, get the tedious mechanics nailed down, and then you can focus on content rather than the muck of production. Pay attention to synchronicity… I’ve just been given Atomic Habits to review for a UK based website, and same day this lands in my inbox. Sitting up & taking nnotice. About setting time limits for writing: some of us are “work set hours” types, and some are “work till you finish” types, and all of us need to cultivate the skill of occasionally using the “other” approach.